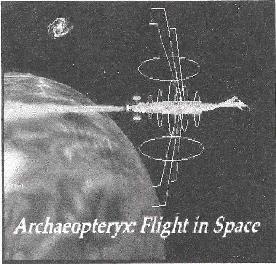 Archaeopteryx - "Flight in Space"
Ah, the wonders of modern technology. Nowadays you can just produce your very own album in the comforts of your own home. And if you're talented enough to play multiple instruments, you don't even need a band. That's apparently what David Graham concluded, as he's taken the do-it-yourself approach to the extreme. But then, being sequestered from civilization on the gulf coast of Mississippi, perhaps he just never found any partners willing to join in on his spacerock adventures. So be it. "Archaeopteryx" is something to be proud of - 11 original tunes and 4 Hawkwind covers, over an hour of interesting music that could be a demo version of a very fine album if Graham chose to pursue it further. The success of the individual tracks relies heavily on the quality of the recording/mix and the sound of the synthetic-drum programming, both of which vary quite a lot throughout the album. There is a central theme of an astral journey looking for alien life and finding 'love in space,' not coincidentally the same sort of trip the Hawks themselves have been on lately. Of the covers, two worked for me and two didn't..."Spirit of the Age" was nicely done, choosing to emulate the Live '79 version rather than the original. In the process, Graham adeptly performs two guitar solos, one each in the style of Lloyd-Langton and Brock. But his version of "Nuclear Drive" is the real winner...the extended pulsing-synth intro adds something to the original, and the overall sound is full and complete here. However, his attempt at "Assault & Battery/The Golden Void" is an impossible task, and the most important part (i.e., the beautifully-cosmic segue) is too abrupt and awkward here. The more recent "Xenomorph" is faithfully-done and has a nice sound...I just don't like this particular tune very well. The original tunes have some nice moments as well. "Manticore Offering" shows off Graham's impressive chops on the keys in his tribute to Keith Emerson (and no, it doesn't sound out-of-place). Also, an interesting mix of heavy fuzz guitar, cool synth-bass, and various space noises all add up to a nice "Fugue Feeling" later on. Particularly nice solo synth playing is also featured on "Flight Through Space" and the finale "Cretu City." "Alien Girl" is the one vocal track written for the album, a fun, bouncy tune where Graham's voice resembles short-term Hawk vet Keith Hale. Overall, the "Archaeopteryx" has the general characteristics of early 80's Hawkwind, around the time of "Church of Hawkwind" or "Zones." Like those albums, this one is also a tad uneven, mainly because some of the mixes are off...too much drum here, too much vocal there. But if Graham chose to take these tracks to a professional studio with a full contingent of musicians (really just himself, a bassist, and a drummer is all), I'd imagine that he could make an album that would truly shine. You can visit David Graham/Archaeopteryx at their web site. Click here to return to the Reviews page, or here to return to Jerry's Prog Rock page.